A sleek wishbone ring, smoothly crafted from 18ct white gold. Either side of the ring is set with a row of glistening diamonds, leaving a chic centre of white gold. Contemporary simplicity with a dash of glamour. Sophisticated diamond jewellery for the modern woman. 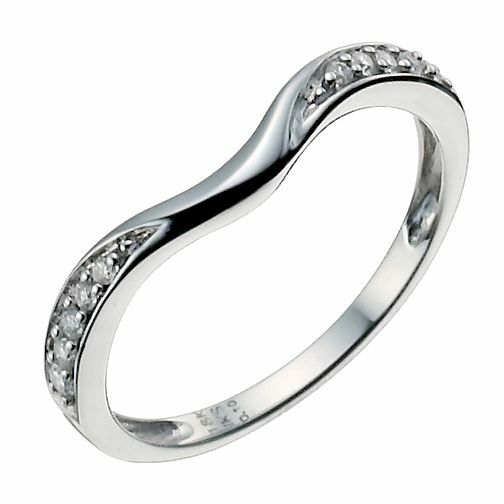 18ct white gold 10 point diamond shaped ring is rated 4.5 out of 5 by 2. Rated 5 out of 5 by Anonymous from Beautiful Wedding Ring I brought this ring as it's fits lovely underneth my squared diamond engagement ring. It's so pretty and a lovely size. It's not too thick but not too thin either. Really sparkly and looks beautiful on its own also. Would recommend buying this. I was lucky enough to get 20% off in the sale also! Rated 4 out of 5 by Anonymous from Simple band This is an unusual wedding band and is really flattering woth my engagement ring. Totally recommend.